The pod bombs that drop through the mission do not have the throw ability upon pickup. Since I can't throw them I am unable to remove the effects to defeat the Veteran Destroyer of Hope. Can confirmed this happened to me as well while helping a friend to finish the story. Some of the achievements are not accessible because of this. I was recently replaying the story mission Dragon Vigil for achievements. When It came time to pick up the pustule I noticed the skill Throw Pustule was missing. I have restarted the mission several time but it keeps happening. This mechanic is critical to certain achievements and the mission as a whole. Is there anything I can do to fix this? I just encountered this too, and it's very annoying since i went in to progress a character through the LS3 story and work on some achievements I never got. This prevents accomplishing the achievements. You can still progress through the story. Just fly off to the side and let Lazarus kill the destroyer boss. It will take 15-20 minutes, though, so grab a bite to eat if you do it that way. I'm having the same issue. Very annoying. Also having this issue. I've been trying to clear out some achievements I never bothered with, but I can't complete "I'm Rubber, You're Destroyer" because the pustules have no skill available after you pick up. I submitted an in game bug report, suggest everyone else does the same. I've got the same issue. I am playing the whole story for the first time and I'm quite disappointed I can't progress. I have not had trouble with this story mission before. It was always easy to handle, once you got the mechanics right. Now, in order to kill the final Veteran Destroyer of Hope, you used to pick up its explosives and throw them at it. But this no longer works, as those explosives no longer have any skills when you pick them up. You can merely use to drop key to get back to your weapon sets, but you cannot throw the pustule. I died several times and couldn't get that boss down to 0%. I left the mission in frustration after a while, because my Thief doesn't have that many HP and spending an eternity to kill one single target while constantly being set on fire, while the shield protecting Aurene is being lowered as well, is out of the question here. It is just not doable without the pustules. I can confirm this myself, I also ran it last night. I submitted an in-game bug report with a screenshot of the lack of abilities while carrying a postule. I was on a spellbreaker warrior, thankfully with a rifle equipped and i was able to range the Destroyer of Hope and eventually (after I don't know how long) defeat him. I died at least 3-4 times during that fight. Aurene's shield stayed around 25% for most of the time the Destroyer of Hope was out. I noticed that defeating the various enemies besides the Destroyer of Hope and making sure the postules didn't explode (which was difficult sometimes when there were lots of circles around) meant that the Exalted person could bring the shield slowly back up and maintain it for the length of the fight. I admit it was INCREDIBLY frustrating. If you try this in the meantime before it's fixed, I'd bring a ranged weapon and stay out of the Destroyer's aoe field, kite it as needed, and kill the other enemies. Eventually it'll go down. Or bring a friend. It's not much of a workaround, but might help. Also, if you have anything that does chill, that's supposed to make the Destroyer vulnerable, but sadly my spellbreaker didn't have any of that, at least not that I could tell. I have the same issue. It made the mission very difficult to complete. Hopefully, ANet will take care of this soon. I hate being stuck in the story, I wanted to finish all campaigns with my thief before the release of the next episode. I'm currently having the same issues and can't make it though without dying. Just did this mission, its a pain in the kitten to do this mission without that skill, and it completely blocks off an achievement. Same issue here as well. I'm stuck there as well. Attempting this without the throwable item takes forever,it's not worth the time. Needs a fix, have several characters stuck at it now. Hmm, my response to this thread is gone? But i coulda sworn i posted here.. Regardless, this mission takes forever without the pustules and blocks off an achievement as well, and it needs fixed. I had the same problem. ended up doing it the hard way without using them. took what seemed like forever and died a few times but I somehow managed to kill it before rage quitting. Yeah I ran into this problem also. I was hoping to do the related achievement, but of course that's impossible right now. Please fix this asap. I'm sad this wasn't fixed in today's patch. Me too, but looking at sheer amount of current bugs, I don't see a fix soon. P.S. For instance, I am majorly miffed over the fact that selecting a human male body type heavier/more muscular than the default one will result in severe clipping issues in the upper leg region with many of the medium armor pieces (and my favorite one in particular), where the pants visibly penetrate the chest piece because the latter is too tight for the body type. I've been replaying story missions with character who haven't completed them. Not only did I encounter this, but not once did I receive the special action skill from Lazarus. It makes the mission quite frustrating and difficult to complete. FREE ports within Not So Secret jumping puzzle! Chest, Dive Completion, Legendary Weapon Collections. Contact me anytime. Same issue here. Can anyone recommend a label to use to report this as a bug in-game? Is it a skill issue, or should I report it as something else? BLocking progress, cause thats what its doing. Is there allready an fix for this? Can confirm this is happening. 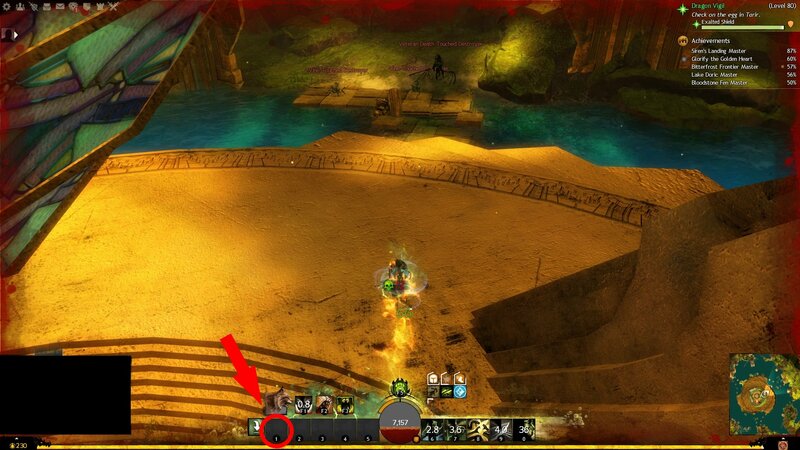 Can we get some Anet eyes on this? Why are progression breaking bugs being ignored? It's still bugged. Needs a fix. This has been fixed and run through QA, so it should be in the next content update. any date for it yet besides soon™? Oh did I hurt your precious feelings? My deepest apologies. they said "its fixed and will be in the next content update"
That's great to hear! Thanks. same as the poaster above. its currently impossible for me to finish it solo and even as a group of 3 we did not manage to get the achievement for maintaining the shield above 50% as well as the one for not letting any bombs explode (which is bugged out as well). I'm Rubber; You're Destroyer is the only one we definitely can't achieve without this fixed. I managed to complete the story quest itself solo. Just pick up the bombs and drop 'em, then go back to killing Destroyer of Hope from range. It's SUPER slow but doable. Hopefully your class has pets of some kind, that helps a bunch keeping him far away from the shield, and you range the mobs in your spare glances. I managed to get the other 3 achieves in one go with a Minion Master friend. He kept Destroyer of Hope far away from the shield, while I focused on the mobs. Managed to keep it well over 50%, and didn't let any bombs go off, and kept myself alive. Which, obviously, will be the release of Episode 3? What a huge disappointment, many people were expecting a patch last night. How does content like this that is super old even get bugged in the first place? Really frustrating as a returning player unable to continue the story for a week. At least there is a date now for the patch. How does content like this that is super old even get bugged in the first place? It seems to be the rule, not the exception, that, whenever a new bigger update is released, for some reason it affects (seemingly) completely unrelated content. Did this patch fix it yet? Last night's patch note says so. I am going to play this chapter now with the two chars who could't before - while waiting for LWS4 Ep. 3 to get fixed (because, 18 hours later, it still isn't, or is it?). Edit: Only that I can't, due to not being able to connect in the first place. I can confirm now that the story mission is working as intended.